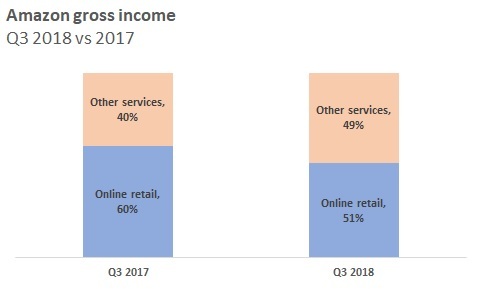 Although Amazon announced third quarter sales 2017 were “up 29%” its retail sales were surprisingly weak – and its profits from retail outside North America may not have improved as much as they seem to have at first sight. Web services (AWS) refers to computing storage, databases, etc. Online stores means income from products bought by Amazon and resold online. Physical stores is mainly 3 months Whole Foods sales, plus a few pilot Amazon stores. Third party services is gross income from products sold on Amazon by third parties. About a third of the selling cost: so $31 bn in income represents about $90-100 bn sales. For all Amazon’s claimed “retail dominance”, its historical record shows scarcely any profit from retail at all since its first annual report in 1998. Indeed, for reasons no-one can understand, it does not break out its extraordinary European retail losses in the annual 10K report filed with the US Securities and Exchange Commission (SEC). But the billion-dollar loss is in data filed with the Luxembourg government, which we discuss on this site. Physical stores (essentially Whole Foods) did not really grow 233%.The numbers quoted for Q3 2017 take just the four weeks of Whole Foods sales under Amazon ownership. For the whole twelve weeks to Sep 30 2017, Whole Foods sales were $3,654 mn: so the $4,248 sales in 2018 were just 14% up on 2017. But the numbers show no evidence that Whole Foods’ sales growth in 2018 at lower margins did anything to compensate for Amazon’s price reductions. Third party sales grew 31% in cash. In fact, the amount shipped may have grown faster: third party sales accounted for 50% of units shipped in 2016, but 53% in 2017. Subscription services (mainly Prime) grew 51%. But the $1.2 bn growth in income to $3.7 bn was the same as the cash growth in the cost of fulfilment to $6.6bn. Prime subscriptions still seem to be costing far more than the deliveries (and film production and royalties and discounts) they are supposed to pay for.